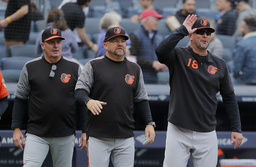 NEW YORK (AP) Brandon Hyde stood outside the Baltimore Orioles clubhouse, his uniform and jacket reeking of Budweiser, syrup and a few other liquids. He had wondered what it would feel like to win his first game as a major league manager but had never given much thought to the scent. "I don't know what this smell is, but whatever it is, I'll take it," he said with a grin as drips fell. Hyde had managed a big league game just once previously, as Florida Marlins bench coach filling in during a 2-1 loss to Tampa Bay in June 2011 after Edwin Rodriguez quit. A Chicago Cubs coach for the past five seasons, the 45-year-old was hired in December and started with a 7-2 defeat to the Yankees in Thursday's opener. "I got pushed in a cart and ended in the bathroom and then got showered with who knows what?" Hyde said. "I enjoyed every second of it." He tied the score on Dwight Smith's single . Catcher Gary Sanchez's wild throw on a double steal, the second of three New York errors, allowed the go-ahead run in. Paxton, a 30-year-old left-hander acquired from Seattle on Nov. 18, dominated with one-hit ball through five innings. He allowed two runs - one earned - and four hits in 5 2/3 innings, mixing a fastball at up to 98 mph with cutters and knuckle-curves. He saluted fans when he walked to the dugout. Orioles: RHP Alex Cobb (strained right groin) pitched in a minor league exhibition Friday and is on track to start the Orioles' home opener against the Yankees next Thursday. LHP J.A. Happ starts Sunday's series finale for the Yankees and RHP Dylan Bundy for the Orioles.